September is such a funny food month. It is still hot and most of the magazines are talking about roasting, stewing and all the rest of Fall’s culinary delights. With the crazy heat, the start of school and a jumpstart to a heavy workload, I can barely think of poaching an egg! Salads are a perfect food solution to all these issues. Both light and filling, you can mix and match these dressings and salads, add grilled chicken, salmon or tofu. Use whatever you have in your fridge — and use for the lunch lunch the next day (if the salad is not soggy). Enjoy these recipes, add, delete, mix and match — be creative and you’ll have a good meal and a little extra down time from all of the crazy activities! These recipes all serve four to six people. Combine yogurt, honey, mustard & cider vinegar in a jar. Tighten lid & shake until blended. Chill 30 minutes before serving. Combine all ingredients, stirring well to combine. Let stand for 45 minutes. Whisk all ingredients together and let stand for one hour. Fill a large salad bowl with lettuce. The traditional Caesar lettuce is romaine. I like to add spinach and radicchio for flavor and color. Mix in croutons (see below), shaved or grated Parmesan and then toss in the dressing. Go lightly. The worst Caesars are the ones that are over-dressed. Taste as you go. For variation you can add cherry tomatoes or toasted pine nuts, both are tasty and add a little pizzazz. Slice baguettes into quarter inch slices. Place in large bowl. Toss with oil until well coated. Add salt and pepper. Place on a cookie sheet in single layer rows and bake at 350 until golden brown, about 20 minutes. Bring quinoa and vegetable broth to a boil. Cover; reduce heat to simmer for 10 to 15 minutes. While quinoa is cooking, chop tomatoes and chives. Mix dressing. Remove quinoa from heat. Allow to cool. Fluff quinoa and add vegetables and pine nuts. Gently mix dressing into quinoa mixture. Serve cold or warm. Serves 6. Another one of the culinary legends is The Cobb Salad. It is hard to believe that something so wonderful could have been so carelessly concocted, but I guess that is the gift of creating. Back in the 1920s, The Brown Derby was a super trendy hangout. The menu consisted of mainly heavy grilled meats, but legend has it that manager Bill Cobb wanted a “light” meal,” so he tossed some things into a bowl. I can’t even imagine a “light salad” consisting of bacon, cheese, egg and avocado (unless you’re an Atkins follower). While there have been many variations, mine stays pretty close to the original. And , of course, you can add or delete any thing you like. 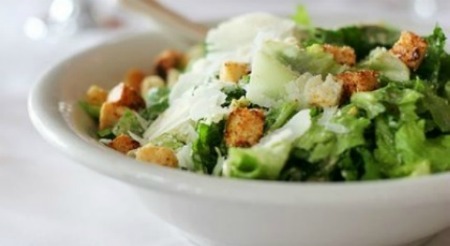 In a large salad bowl toss together the romaine, Boston lettuce and watercress. In a small food processor mix shallots, vinegar, mustard, and salt and pepper to taste, add the oil in a slow stream, mixing until the dressing until it is emulsified. Pour into a bowl and stir in blue cheese. Pour it over the lettuce, and toss the salad well. In a large salad bowl toss together. Chill for at least one hour before serving. Great with the lentil salad, but also awesome with a big salad of mixed greens and any vegetables that you have on hand. Halve the avocado and remove pit. Scoop out flesh into a food processor. Add mustard, lemon juice, zest Tabasco. Salt and pepper to taste and blend until smooth. With the motor running pour in the oil in a steady stream. Allow it to become rich and creamy about one minute. In a large bowl add the lettuce, watercress and pepitos. Toss with the dressing and serve. In a large bowl, combine the rice, romaine, oranges, tomatoes and onion. For dressing, in a small bowl, whisk the orange juice, vinegar, oil, tarragon, garlic powder, salt and pepper. Set aside 4 teaspoons. Pour remaining dressing over rice mixture and toss to coat. Divide among four plates; top with shrimp. Drizzle with reserved dressing.